IF YOU want the world’s finest fur coat, with wool long enough to thread a needle and fine as a spider’s web, you can get it, not from animals roaming at large in faraway places, but from captive rodents. On three farms in Idaho, Utah, and California these tiny chinchillas grow. Naturalists call them the “missing link” between the rabbit, the squirrel, and the rat. From the South American Andes, a former mining engineer, alone of the scores who have sought with fortunes and considerable skill to remove these strange little creatures from their native haunts in Peru and Chile to European and American pens, has transplanted a dozen. Today his herd numbers 160, only twenty more than would be required to make one large coat like the one illustrated at the extreme right. Yet these are the only known chinchillas in the world that are reproducing in captivity. In warm California weather and the colder winters of the northwest, they continue to thrive, six years after M. F. Chapman brought them from the Andes. In that time, they have increased more than thirteen fold despite losses from theft and disease. Today the three herds at Idaho Falls, Idaho, Logan, Utah, and Inglewood, Calif., are worth a king’s ransom. Single pairs for breeding have sold as high as $5,000. One coat made up of 140 pelts has brought $45,000. Single skins in New York and Los Angeles sell for $200 to $300. Smugglers occasionally offer pelts in the world’s fur capitals, since neither live animal nor pelt may be legally rmoved from South America, yet only one man, a New York furrier, is known to have a sufficient number to manufacture a full-length chinchilla coat. Chinchilla fur is rare, beautiful. It once was worn only by monarchs and their queens, but the passing of monarchies and their fabulously wealthy courts has made the fur available to others. Not more than a dozen chinchilla coats exist in any American city; possibly not over a hundred in the world. One naturally thinks of Russian sable when discussing rare furs. The great value of that fur comes not so much from its beauty as from the difficulty of trapping and matching the sables. Often two or three years is required to find a sufficient number of sable pelts to make one coat. Yet sables cannot be reared in captivity while chinchillas reproduce as well in American pens as in the Andes 16,000 feet above sea level. They live their new lives in spacious stalls measuring six by sixteen feet; one male and six females to each stall. From two litters a year in the wild, they have increased in many instances to three in captivity, the average of two young in each litter remaining the same. Ermine, one of the most beautiful furs, white and blue fox, caracul are all found in women’s wardrobes, yet chinchilla remains the most desired and least attainable fur in the world. Dyed rabbit at one-fortieth of the cost often is offered as a substitute, but an expert can tell a rabbit coat from a chinchilla at a distance of 100 feet. Chinchillas are rabbit-like in appearance, though much smaller than the average rabbit. Little larger than a man’s hand, they live among the Andean rocks. In captivity they spend much of their time in cavelike recesses of their pens. In the open, their protective coloring enables them to blend among the rocks and they can hardly be seen when on the run. They emerge at dawn and at dusk to feed, eating the same vegetables and grains a domesticated chicken consumes, though hardly as much. Chapman says his feed bill averages not more than $1.80 a year per animal. They are subject in captivity to no more diseases than are American rabbits, and, when one dies, an autopsy usually reveals little balls of hair in the stomach. The chinchillas lick themselves and the long hairs pass with food into the stomach, where they remain undigested. There are two commonly known species, although Chapman has had as many as five species growing together. Gradually four disappeared until he now has only the Chinchilla lanigera, found chiefly in the mountains of central and northern Chile. The skin is finer than that of other species and its color is a smoky gray with black markings, with the under parts a dead gray with a yellowish tinge. As I held a fine male, stroking its long hairs, I realized why these rodents have been hunted since the remotest ages. Once the Incas wove warm cloth from their hairs, even domesticated them and ate the flesh after shearing the fleece. Though they have been known in South America for centuries, not until the turn of the century did any reach western markets. 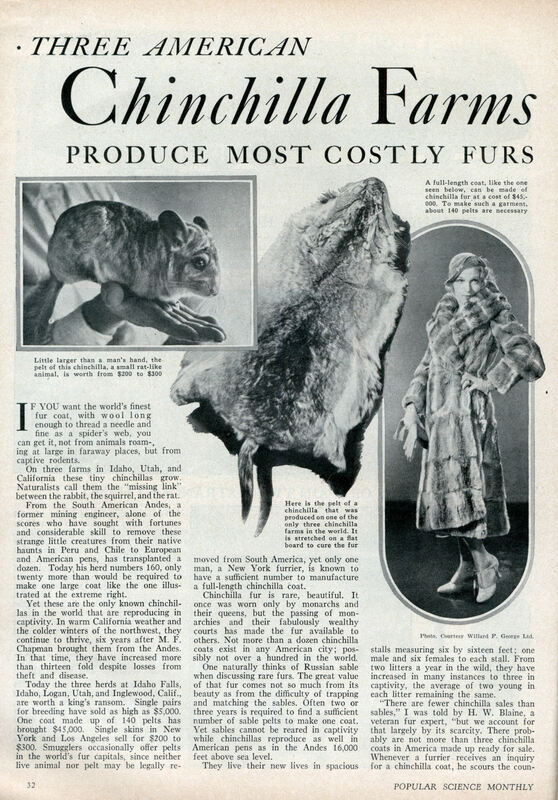 Immediately furriers became intensely interested and following the importation of a few skins to Paris, world-wide efforts began to bring chinchilla coats to wealthy men and women. Yet Chapman is the only white man who has succeeded in raising themâ€”and he has his difficulties. Someone recognized the tremendous value of the Chapman herd and in the dead of night stole into his mountain ranch at Tehachepi, Calif., (recently abandoned) and made away with thirty-five sturdy chinchillas. Sixteen were carrying young. The potential loss, therefore, amounted to fully seventy of the animals. Chapman, in swearing out warrants for the unknown culprits’ arrest, placed a value of $54,000 on the stolen animals. Late last fall eighteen were traced to a ship bound for Germany. So closely did United States operatives press the hunt that they learned five died en route. Later one American confessed his part in the theft and today is paying the penalty in San Quentin prison. Two of those smuggled to Germany are alive today, all the others having perished. The other seventeen have not been traced. Chapman’s chinchilla exploit is packed with drama. Formerly a mining engineer,he went to South America nine years ago for a mining syndicate. He made his headquarters high in the Andes of Chile and Peru and while living among the native Indians and Chileans became interested in the chinchillas. He had heard great tales of their former high position in the international fur trade. One man had exported 100,000 skins from Chile in 1884. In 1901 fully 1,000,000 skins were exported from that country. San Pedro de Altacama was the most important local South American market then. From nearby Molinos, on the western border of La Plata, one man exported 3,000 dozen pelts annually for years. But the trade had languished, for the chinchillas had gradually disappeared from that region. “White men cannot travel into the country where the chinchillas live,” Chapman told me, “When I first became interested in them, I sent out a couple of Indians to hunt them. Soon I had twenty-three Chileans and Indians on the trail. Yet the net result of all that hunting was a dozen animals. I finally left South America with eleven animals; and arrived at Los Angeles with a dozen. An expectant mother had given birth to two while on the high seas and we managed to save one of them. “My CHINCHILLAS came from the highlands above Potrerillos in the province of de Altacama. I lived at an altitude of 11,300 feet but the trappers went a mile higher. Strange as it may sound to people unaccustomed to living in the wild, they actually caught several with their hands. The chinchilla is one of the most curious animals alive. Fire a gun and he runs into his hole; but a moment later you see his little head sticking out as he looks around the mountain. Through a combination of circumstances, Chapman, who as a youth raised rabbits and squirrels for their hides at Grants Pass, Ore., was set down where chinchillas were considered to be as abundant as anywhere on the continent. Meantime several expeditions had spent fortunes in a fruitless effort to catch and transplant several pair to the United States or to Europe. 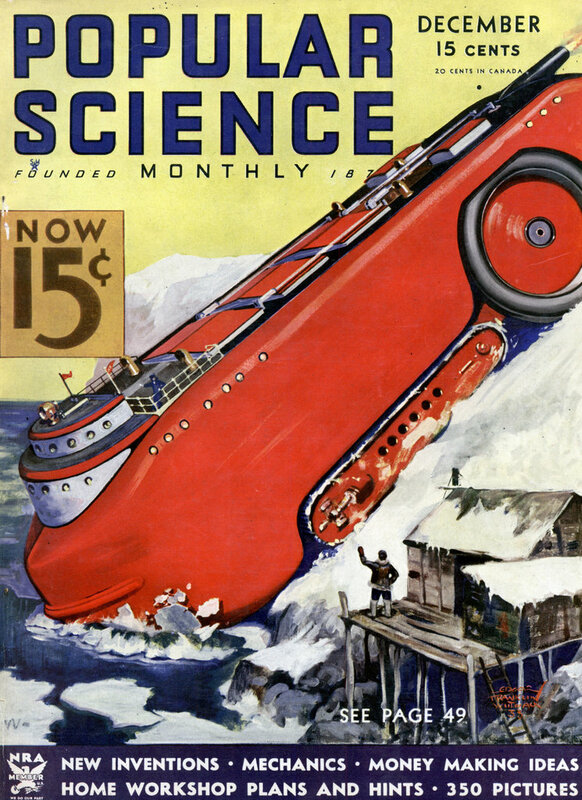 Undismayed by the many failures of which he had heard, Chapman continued his search. At last, his runners brought him eleven grown animals. For two years he kept them at an altitude of 11,000 feet, studying their habits, watching over their health. Then he carried them down the mountain and stopped a year 8,000 feet above the sea. As the ice began to thaw after the third year, he loaded them in wire cages, strapped them on the backs of burros and completed the journey to the sea. THE worst part of the long trip lay ahead, the sea voyage. He boarded a steamer from Iquique, Chile, with the little fellows panting for breath. Accustomed to thriving in freezing gales far below zero, they suddenly were catapulted into a summer heat none ever had experienced. For forty days and nights, Chapman kept them in virtual refrigerators â€”ice-chilled cages curtained with moist canvas. Yet they suffered so that many times during that trip he applied ice packs to their heads as various animals passed out in the heat.